Omurice- Hello everybody, welcome back with ZetiraKitchen! Today i will share about How to Make Omurice Japanese Food with Delicious Recipe. 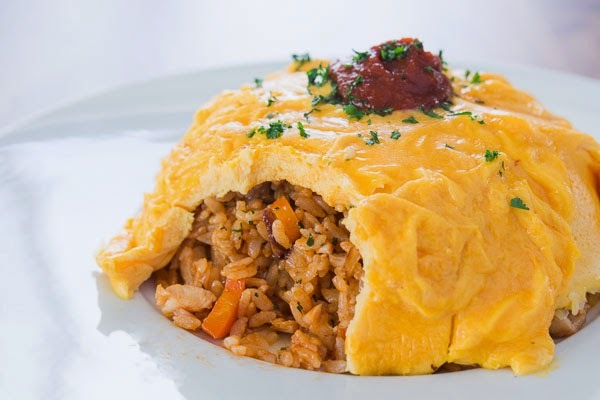 Omurice is one of the famous dishes in Japan, even now this menu is known all over the world. This food consists of omelet made with fried rice plus vegetables and tomato sauce scratches on top to enhance and enhance the flavor. Omu and raiusu are a combination of omelette and rice which means 'omelet' and 'rice'. To make it the same as making an omelet. But what makes it different, the eggs on this menu are mixed with fresh milk or cream to increase the softness of the eggs later. making fried rice is like making standard fried rice in general. Let's to make it! Beat eggs, cream, and salt in a bowl until mix well. Pour oil to frying pan, then add onions, carrots and garlic. Saute with medium heat until the carrots are soft and smells. Up the heat into high heat, put the chicken then continue sauteing until the chicken warmed up. Add rice into frying pan, and stirring to break up the clumps of rice. Then seasoned with ketchup, salt, or pepper. stirring until they mixture. If it done, pour the fried rice on a plate. Beat another egg with heavy cream, add some salt for tasty. Pour egg mixture into a pan low heat. Using spatula to stir gently the mixture egg. But stop stirring if there isn't enough liquid of egg left to spread out across the pan. Cover the pan and turn up the heat into medium heat. Put the eggs over the fried rice.